Developed following a two-day Brandon City Council retreat in March 2015, ‘Our Plan, Our City’ lays out 10 priority areas where Council and City Administration will focus resources and strategic efforts over the next three years. Among the priorities will be pursuit of long-term financial stability for the Keystone Centre, determining the future of the Wheat City Golf Course, establishing a City of Brandon Drainage Master Plan, implementing strategies from the City of Brandon’s five-year Economic Prosperity Plan, and prioritizing improvements for the City of Brandon’s Water Treatment Plant. Other areas on which the 2015-2018 Strategic Plan places focus include those of recreation facilities and greenspace development, community inclusion, financial stewardship, downtown revitalization, and planned, sustainable development growth. 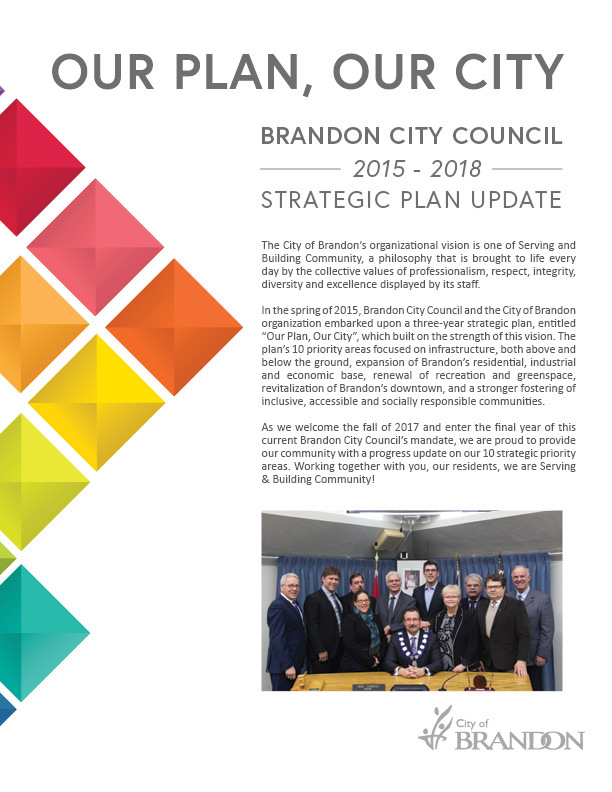 Each member of Brandon City Council has been paired with key members of City Administration to champion progress on the strategic plan’s priority areas, with annual updates provided to the community.